What is AJAX and Bootstrap? Bootstrap is the one of the most popular HTML, CSS and JS framework for developing responsive, mobile first projects on the Web. 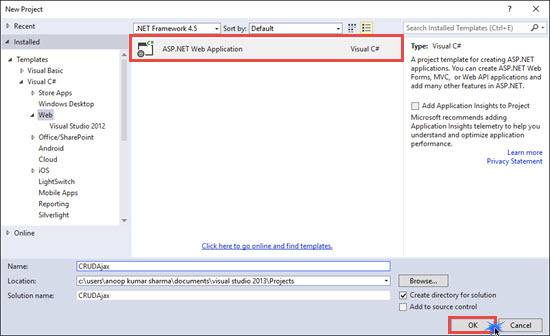 Select Empty ASP.NET MVC template and click OK.
Now, right-click on the project and click Manage NuGet Packages. 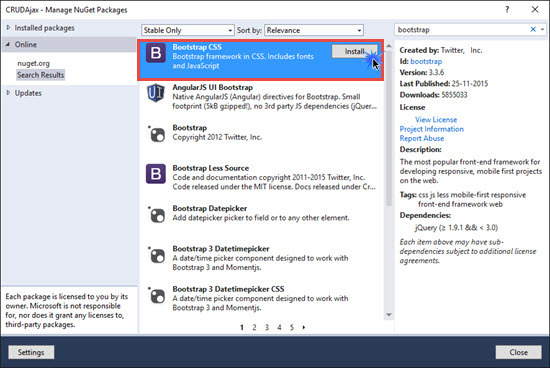 Search for Bootstrap and then click Install button. 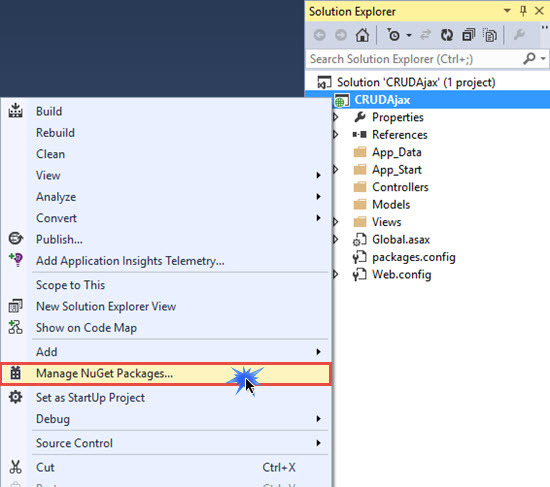 After installing the package, you will see the Content and Scripts folder being added in your Solution Explorer. 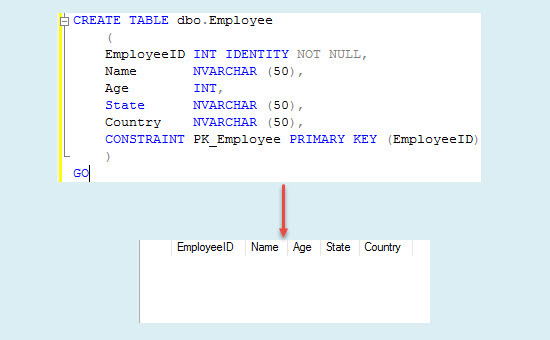 After the table creation, create the stored procedures for Select, Insert, Update and Delete operations. Right click on Modal Folder and add Employee.cs class. Now, add another class in Modal Folder named as EmployeeDB.cs for the database related operations. 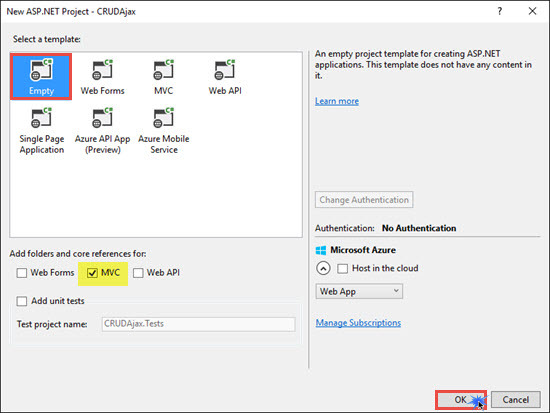 In this example, I am going to use ADO.NET to access the data from the database. 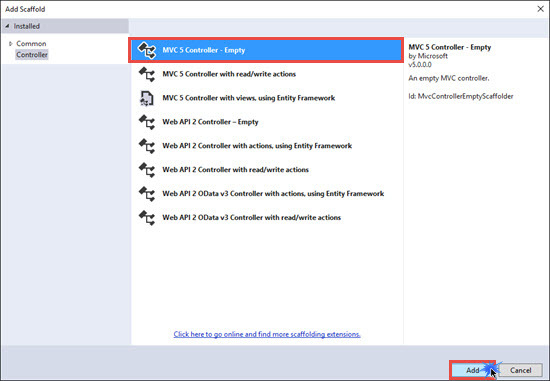 Right click on Controllers folder, add an Empty Controller and name it as HomeController. Right click on the Index action method of HomeController and click on Add View. As we are going to use Bootstrap and AJAX, we have to add their relative Scripts and CSS references in the head section of the view. I have also added employee.js, which will contain all AJAX code, that are required for CRUD operation. In the code, given above, we have added a button for adding New Employee. On clicking, It will open the modal dialog box of the bootstrap, which contains several fields of the employees for saving. We have also added a table, which will be populated with the use of AJAX. Thanks Manav. You can download the source code from the link given in the article. i want to add table content sorting and filter with datatable, can you help me sir? Thanks asprys dev8, I will post an article on this topic within a week. Stay connected..! !